Now-a-days, multiple social media platforms are sponsoring video ads as more and more people are preferring to make buying decision on watching video ads. Over 500 million hours of videos are watched on YouTube each day. For businesses, this presents a huge opportunity to engage with prospective customers as video not only allows to convey a message faster, but also get the most attention. As mentioned in the previous post, this post will focus on how to run YouTube Ad campaigns and how it can be beneficial for your business. 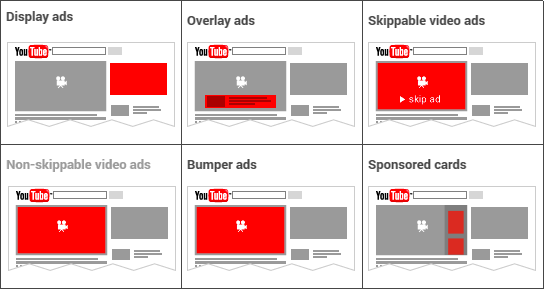 Before knowing the process of running video ads, it is vital to know that YouTube comprises of ‘skippable ads & non-skippable ads’. Skippable ads usually appear before you want to watch a certain video and they can be skipped. They are also called Trueview ads. Non Skippable Ads last for 15-20 seconds that force people to watch. More than 4 billion videos are viewed on a daily basis. Video ads helps you engage with audience easily by creating skippable or non-skippable ads that would entice your prospective customers to know more about your brand. Google AdWords for Video helps you build your email list by adding links, annotations and cards. Links or displaying cards allow you to convince your customers to stay on your channel and providing video suggestions from your playlist. By regularly running meaningful video ads, your brand can earn attractive revenue through Google’s AdSense for Video programme. Additionally, it helps you drive traffic to your website which results in improving your list of leads and sales, as well as increasing your brand’s conversions. When it comes to spending on AdWords for Video, your brand will have to pay only for engaged views. This is possible only when a person views watches your video ad for 30 seconds. When your brand is consistent in running Video Ads, it opens up opportunity for grabbing the attention of new visitors. YouTube ads gives your brand maximum exposure by helping you reach a worldwide audience. With so many companies focusing on social media marketing, video ads will give you an edge over your competition as it promises more engagement and gain exposure in a predominantly untapped market. The idea of creating a video seems easy, but only a powerful story-line and strong marketing efforts can make a campaign successful. In order to create dominance in Adwords for Video, your brand needs to create high-quality videos on an ongoing basis that drives required revenue and serves your company objective. Is your brand open to YouTube Ads? Our digital team would love to help you out, as we’re one of the best digital and advertising agencies in Navi Mumbai.